CD reviews: "My Dear Family" and "After Hours"
These reviews first appeared in the January 3, 1997 issue of the North County Times. 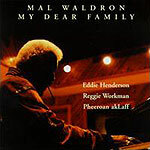 Two albums featuring pianist Mal Waldron that are both a few years old but only now making their way to our shores (after release in Japan and Europe) show that while Waldron may be familiar to serious jazz fans, even casual listeners unfamiliar with his work owe it to themselves to check him out. His instrumental release, "My Dear Family," is a display of a master at work. He is surrounded by heavyweight talent like trumpeter Eddie Henderson and bassist Reggie Workman, while saxophonist Grover Washington Jr. turns in a biting, hard-edged performance that will defy what most of his fans have come to expect (but which hearkens back to his early days as a straight-ahead jazzman). 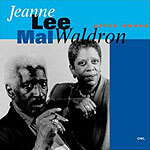 On the Waldron-penned "Left Alone," which reminds of the old standard "Motherless Child" blues, Washington and Waldron duet on long, languorous passages, sometimes trading single bars as they engage in a beautifully empathetic conversation with their instruments. It's only one high point of an album of overarching beauty and artistry. Compared to the excellent "My Dear Family," "After Hours" is a bit of a disappointment. While the song selection is of the highest order  Ellington's "Caravan," Mingus' "Goodbye Pork-Pie Hat," Cole Porter's "Every Time We Say Goodbye"  and Waldron displays an exquisite sensitivity in his backing of Lee (it's just the two of them on this set), the truth is Lee's voice isn't really suited to standards or this setting. Her voice is simply too thin to hold its own against Waldron's expressive piano playing.